NEW YORK -- Stocks plunged in the U.S. and worldwide Friday after Britain voted to leave the European Union. The result stunned investors, who reacted by rushing to the safety of gold and U.S. government bonds as they wondered what will come next for Britain, Europe and the global economy. U.S. stocks gave up all their gains from earlier in the year. 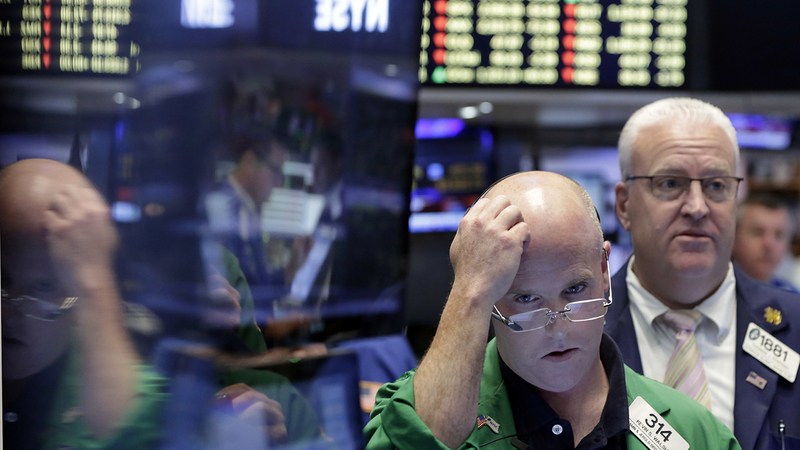 The Dow Jones industrial average tumbled 611.21 points, or 3.4 percent, to 17,399.86. The Standard & Poor's 500 dropped 76.02 points, or 3.6 percent, to 2,037.70. Both indexes took their biggest loss since August. The Nasdaq composite suffered its biggest loss since mid-2011, down 202.06 points, or 4.1 percent, to 4,707.98. Indexes in Europe and Asia took even larger losses. The British vote brought a massive dose of uncertainty to financial markets, something investors loathe. Traders responded by dumping riskier assets that appeared to have the most to lose from disruptions in financial flows and trade: banks, technology companies and makers of basic materials. More shares were traded than on any day since August 2011, when Standard & Poor's downgraded the credit rating of the U.S. government during a crisis over the budget and the country's debt ceiling. Britons voted to leave the EU over concerns including immigration and regulation. It's far from clear what that will mean for international trade or for Europe, as the EU, which was formed in the decades following World War II, has never before lost a member state. "This vote is a step away from free trade," said Bob Doll, chief equity strategist Nuveen Asset Management. "When you add to it the specter of the last couple of years of terrorism it causes the average individual ... to be more nationalistic, more populist, more protectionist." Bond prices surged and yields fell. The yield on the 10-year U.S. Treasury note dropped to 1.56 percent from 1.75 percent on Thursday, a large move. Banks took the largest losses by far. Citigroup plummeted $4.16, or 9.4 percent, to $40.30 and JPMorgan Chase fell $4.45, or 6.9 percent, to $59.60. They have the most to lose in Britain's departure from the EU because they do a lot of cross-border business in Europe based from their offices in London. They also become less profitable when bond yields fall, since that lowers interest rates on mortgages and many other kinds of loans. Microsoft fell $2.08, or 4 percent, to $49.83 and IBM gave up $8.76, or 5.6 percent, to $146.59. DuPont gave up $3.21, or 4.6 percent, to $66 and LyondelBassel Industries lost $4.14, or 5.2 percent, to $74.91. The pound fell dramatically, to $1.3638. At one point the British currency hit a 31-year low. Oil prices sank. Benchmark U.S. crude declined $2.47, or 4.9 percent, to close at $47.64 a barrel in New York. Brent crude, the international benchmark, fell $2.50, or 4.9 percent, to $48.41 a barrel in London. In addition to bonds, other safety assets also soared. Gold jumped $59.30, or 4.7 percent, to $1,322.40. That's its highest price since July 2014. Silver rose 44 cents, or 2.5 percent, to $17.79 an ounce, its highest in more than a year. Gold producer Newmont Mining rose the most in the S&P 500 index. It climbed $1.80, or 5.1 percent, to $37.19 and set a three-year high. High-dividend utility companies made tiny gains. Consolidated Edison rose $1.55, or 2 percent, to $78.41 and Duke Energy added 38 cents to $82.43. The vote only begins the process of Britain's departure from the EU, and it also begins years of negotiations over Britain's trade, business and political links. Observers wonder if other nations will follow in Britain's footsteps by leaving the EU. "This is a negative in economic terms for the UK," said David Kelly, chief global strategist at JPMorgan Asset Management. "The EU will be very tough negotiators with them." Investors had sent stocks higher this week as they gradually grew more confident, based on polls and the changing odds in the betting market, that Britain would stay in the E.U. They sent the pound to its highest price of the year and sold bonds, pushing yields higher. Those gains were rapidly undone Friday. Britain's FTSE 100 dropped 3.1 percent. At one point it was 8 percent lower. The German DAX index sank 6.8 percent and France's CAC 40 index tumbled 8 percent. Japan's Nikkei 225 finished a wild day down 7.9 percent, its biggest loss since the global financial crisis in 2008. South Korea's Kospi sank 3.1 percent, its worst day in four years. Hong Kong's Hang Seng index tumbled 4.4 percent and stocks in Shanghai, Taiwan, Sydney, Mumbai and Southeast Asian countries were sharply lower. In other energy trading, wholesale gasoline sank 8 cents to $1.53 a gallon. Heating oil fell 7 cents to $1.46 a gallon. Natural gas lost 4 cents to $2.66 per 1,000 cubic feet. In other currency trading, the dollar fell to 102.24 yen from 104.47 yen while the euro weakened to $1.1121 from $1.1351.